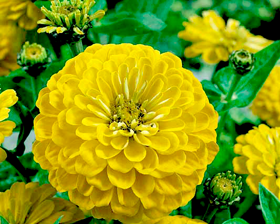 These bushy plants, 50-80cm high, are simply smothered nonstop all season with cheerful, 10-15cm fully double blooms. The petals are an intense shade of yellow, and they surround a bold, eye-catching central cone, Profusion is a dense, bushy, many-flowered plant that fills the garden with color! Sow seeds on the surface of a good, free draining, damp, seed compost. Then lightly cover, 3mm deep with vermiculite or compost. Place container in a propagator or seal inside a polythene bag at a temperature of 20-30C until germination which usually takes 7-14 days. Can also be sown direct into the soil after last frost.